With over $1,000,000,000 of e-commerce transactions flowing through our platform, our Usability + Technology formula is a proven winner. Since building one of the nation’s first e-commerce websites in 1996, HTC's clients have collectively transacted over one billion dollars online. They’ve also exceeded sales objectives, cut costs and become more profitable. Our experience and expertise in e-commerce is deep and proven. We deliver elegant, enduring and easy-to-use e-commerce solutions that enable businesses to profitably inform, promote and transact online. 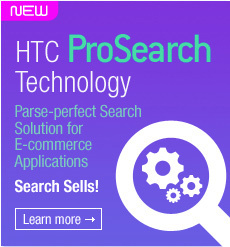 HTC has the experience, expertise and talent to execute any successful e-commerce strategy. To learn more about how e-commerce can benefit your business, contact Tom Kouri at (514) 739-2461 x201.